*sigh* I'm just not meant to sleep early.... This is not the first… - A mummy's inane blabberings.. This is not the first time it happened. Whenever I decide to call it an early night and go to bed early (abt 9/10pm), I'll be woken up in the early morning (usually by the sound of someone snoring *sob*), most of the time about 3 to 4am and just can't get back to sleep immediately! And by the time I finally do, it will be almost 6am and when the alarm starts ringing at 7am, I'll be so damn shack. It's sooooooo exasperating!! I guess my system is simply not used to me sleeping early. I should just stay my insomniac self and sleep at 1++ am everyday. The star of the day...Zoe Fynn Wee! She's so adorable..so much hair! I love the smell of new borne babies! 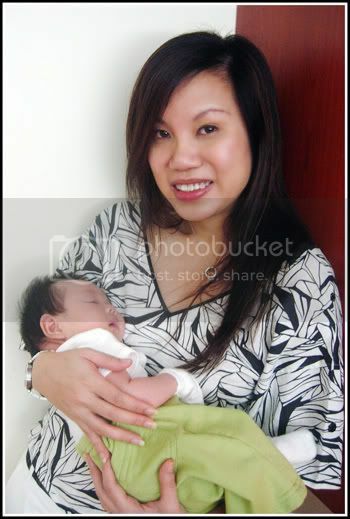 heh, check out Pei Fen's "Look..I know how to carry baby liao!" expression. And Joan looks soooo radiant! Her skin was so fair and smooth! Jean refused to let us take pics of her but she's doing fine and looking good! Doc said she should be going home tomorrow! wah..do you wake up so early every morning? 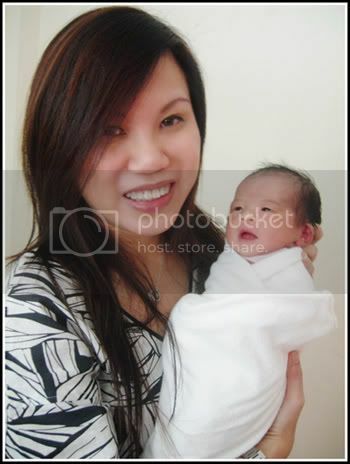 yeah..i think most moms enjoy carrying babies..esp when theirs have grown up...I love the smell of a newborne most!! gotta agree...esp when they are sleeping so peacefully! eh exams coming up? good luck eh! 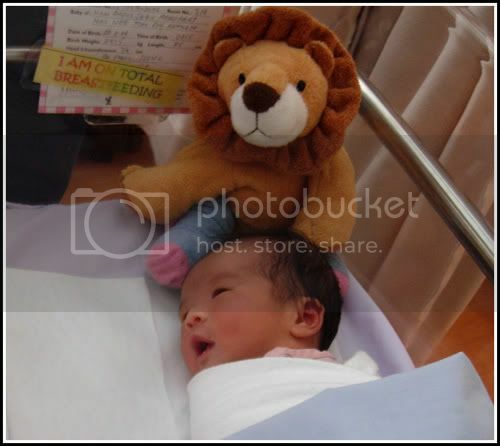 Hello baby Zoe... so cute!!! All the girls look fabulous! Esp. Peifen. pei fen lost a lot of weight the healthy way - exercising but she still complain not enough!! i think joan looks a little different. it's almost as if her features changed a little. she looks very radiant. that's a mother's glow, i guess! i have to agree. i did a double take when i saw her..never saw her looking so good before and she has no makeup on! Zoe is a little beauty! Hahaha...I was wondering how come no pic of Jean. i am excited to read jean's birth story soon. no flash plus photoshop = good skin hehe..i didn't need to do much to peifen though. she's looking really good. jean should be checking out today so she should be updating soon! all you ladies look so good there! any secrets to smooth and glowing skin? lil' zoe looks so cute! why not consider a lil' bro/sis for aidan? we were actually discussing abt baby smells at the hospital. jean says that the smell of the kid stays with him/her ..and that she is able to identify aly thru her smell..
but i thought differently..that all newborne babies have this really nice smell that goes away when they r abt 3-4 months.. Sorry I missed you guys at the hospital. 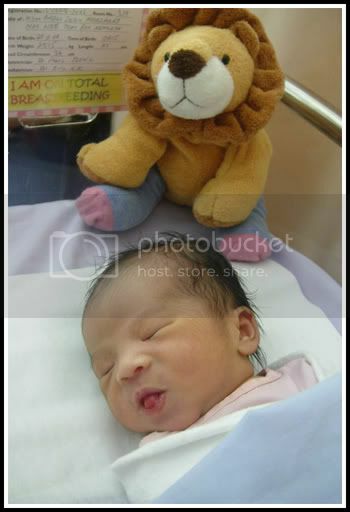 And she is discharging today!!! Have to throng to Woodlands to see her and Zoe... hehe.. I can feel both PF and Angie's uterus skipping inside their bodies!! when will u be going? i have some dvds to pass her so if possible, can pick it up from my place first? 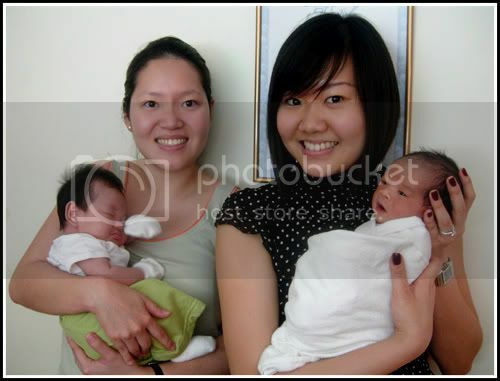 aiyoh...so cute all these babies!! tempted enough yet to go for no. 2?? 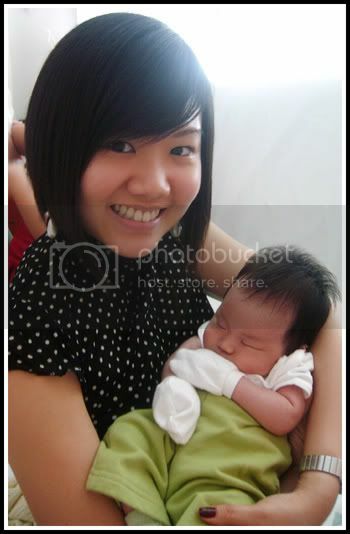 hehehe...love the last two pics of you and Pei Fen carrying the babies, soooooo sweet and natural lor!! heh still not tempted!! must stay firm!